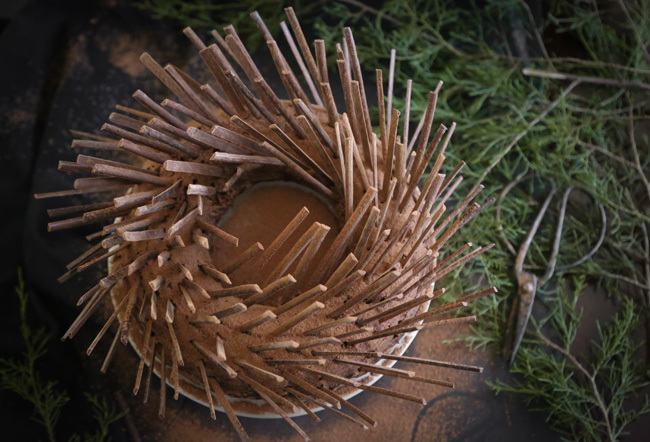 You can find the tools I use for making the chocolate sticks here. It's relatively inexpensive and the comb can be used to texture the edges of frosted cakes, too. comb straight through it. You can tidy the edges by running the scraper across each end. 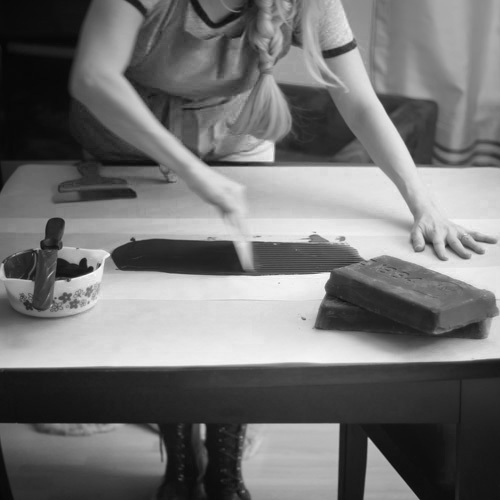 After the chocolate stands for a few minutes and the surface becomes matte, you can cut it into even lengths with the scraper. This particular scraper has a very flexible knife, which is important for removing the sticks from the paper. 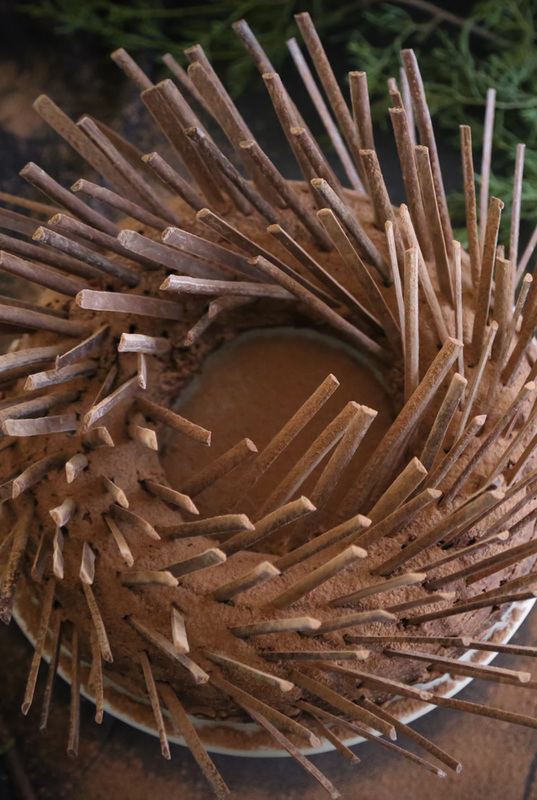 It glides underneath the sticks easily without breaking the thin pieces of chocolate. This cake was given a generous soak of champagne syrup and then left to absorb overnight. 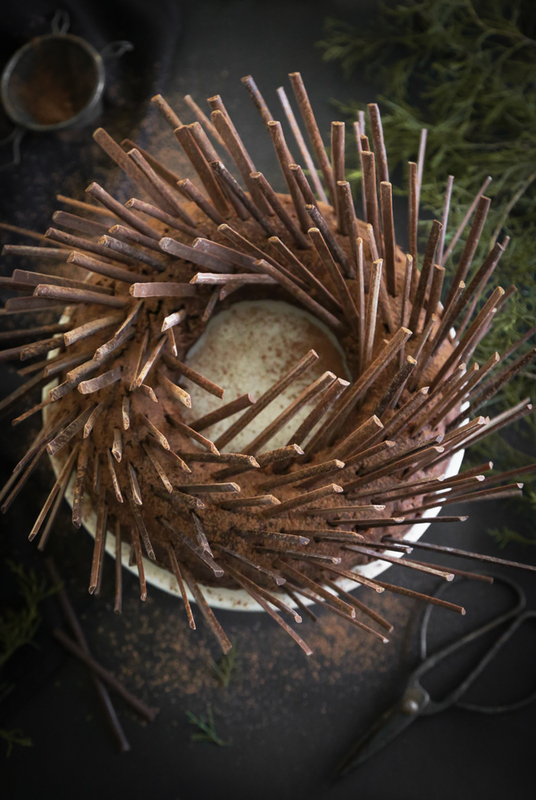 This is an important step if you're using the chocolate sticks as decoration. If the genoise cake isn't properly saturated, then the chocolate sticks will not insert easily and because they are so thin, they'll break. I really loved the flavor of sweet champagne syrup with chocolate cake. It tastes like a celebration. And with that, I'll bid you a very Happy New Year! Plan ahead, this cake needs to stand for at least 3 hours or preferably overnight. 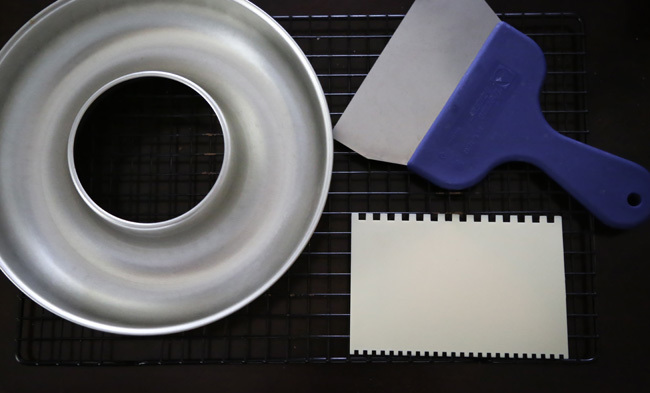 Grease and flour a 9-inch round baking pan or a 9 3/4-inch Savarin mold. In a heat-proof bowl (preferably stainless) beat together whole eggs, egg yolks, sugar and salt, using an electric hand mixer at high speed. Place bowl over pan of simmering water and continue beating with the electric mixer until the mixture is warm. Remove bowl from water. Continue to beat until mixture is cooled and increased in volume; this will take 5-7 minutes, and the batter should be thick and leave a trail when the beaters are lifted from the bowl. Sift together cake flour, cornstarch and cocoa. Sift dry ingredients over the beaten egg mixture, gently folding with a rubber spatula. Pour batter in prepared pan. Bake for 30 minutes or until cake springs back when touched with finger. Cool in pan on wire rack for 10 minutes. Loosen edge with knife and invert cake onto a rack. Cool completely. For the syrup, combine the champagne or prosecco and sugar in a small saucepan. Simmer over medium-high heat, stirring constantly, until the sugar is melted. Remove from heat and let cool until just warm, about 20 minutes. Place the cake upside down on a large sheet of plastic wrap. Poke holes in the bottom of the cake using a fork. Using a pastry brush, liberally brush half the syrup all over the bottom of the cake. Turn the cake upright and brush with the remaining syrup. Be sure to use all the syrup so the cake is thoroughly saturated. Loosely wrap the cake in the plastic wrap, and then in a layer of aluminum foil and allow the cake to stand at least three hours or preferably overnight. 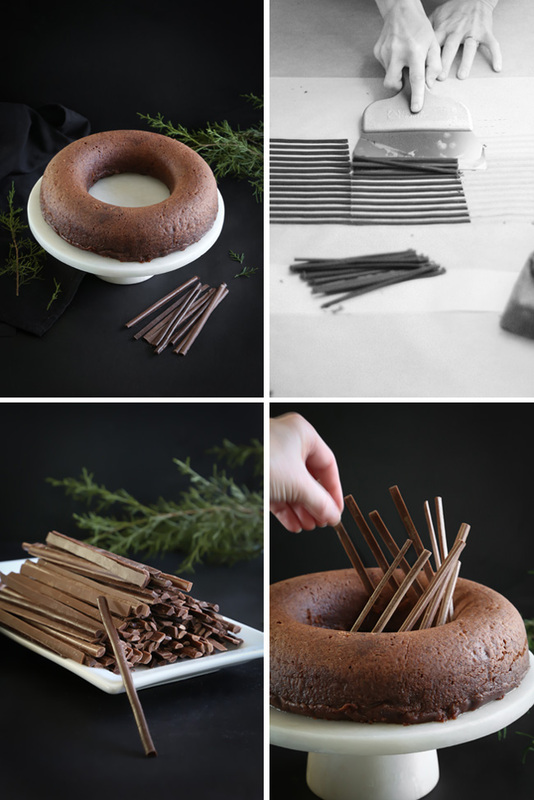 To decorate the cake, press the chocolate sticks into the cake at a 45 degree angle, beginning at the center. 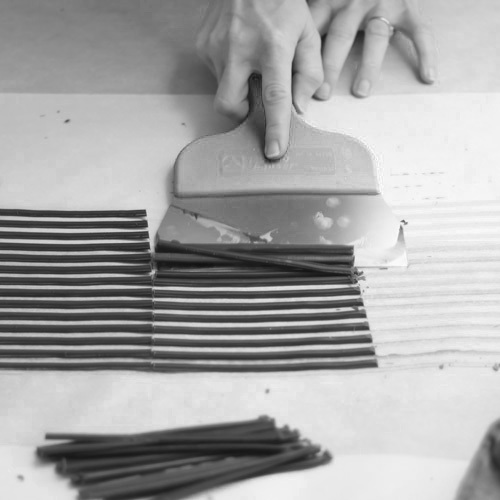 Do this gently, as chocolate sticks are fragile. Avoid holding the sticks in your hands as you decorate because they will become soft. Keep them on the counter top. Continue pressing more sticks into the cake, moving outward, until the entire cake is covered. Dust the cake with unsweet cocoa, if desired. Store the cake in the refrigerator, covered with plastic wrap, for up to 3 days. Note: This cake is excellent brushed with Kirsch (cherry) syrup. Just replace the champagne with Kirsch liqueur and serve with whipped cream. Add a few Morello cherries and you've got Black Forest Cake. Edit 1/6: Someone asked how this cake is sliced. If you cut between the chocolate pieces at an angle, you'll get a clean slice. Why didn't we think of this idea!?!? Lol...Seriously though this is absolutely brilliant! Happy New Year! You are surely a genius and here's to even more brilliant creations like this in 2015! I wholeheartedly agree with your motto of going chocolate when in doubt! I couldn't be happier to see this. It looks amazing and has all the flavors and textures I crave. Happy New Year!! and congrats on your book date; how very exciting and accomplished you must feel. Slow and steady is always a good course. The cake looks so nice and very artsy. 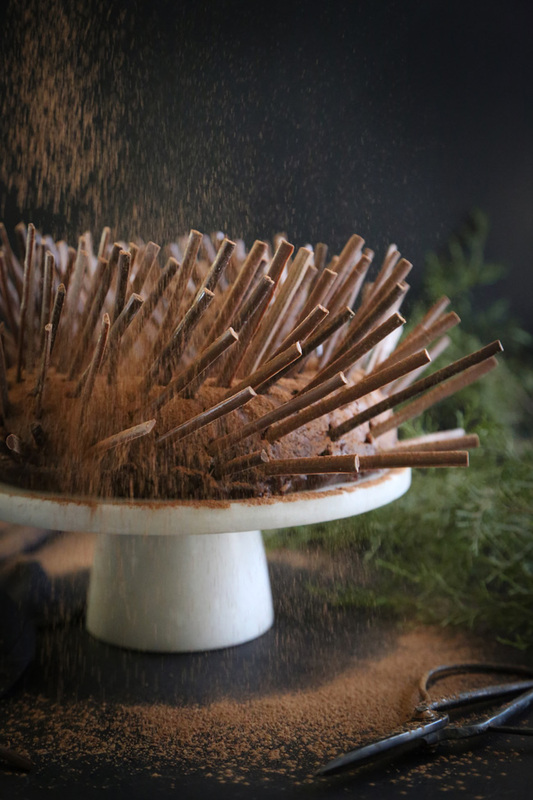 I love the photo of the shower of cocoa powder on top of the cake. Interesting way of decorating a cake, looks delicious! Now this is one INCREDIBLE cake. I seriously have no words for it.. but you can definitely cut me up a slice (or two)! All chocolate has the potential to turn spotty if overheated. The cocoa butter comes to the surface and makes it whitish and strange looking. This is one reason to temper the chocolate, the other is to get a pretty shine and (my favorite) a snap! I like how tempered chocolate snaps between the teeth. Happy New Year! I love black forest cake which is genoise, but this looks phenomenal! Reminds me of a fall/winter wreath. So pretty and plenty of wow factor. Happy New Year! This is such a cool looking cake. I'm really looking forward to your next book! Well anyways thank you so much for everything and have a happy new year! Wow! So so cool! Happy New Year, Friend! Wow, such an impressive cake! Love the design and gotta give a try to your chocolate decorations. Thanks for sharing! I'll be it tastes amazing, too. This looks amazing - I've never seen anything like it before, but I love the look. So cool and sounds even more delicious!